Stearic Acid, Rhus Succedanea Fruit Wax, Talc, Hydrogenated Castor Oil, Cera Alba (Beeswax), Cera Microcristallina (Microcrystalline Wax), Paraffinum Liquidum (Mineral Oil), Hydrogenated Coconut Oil, Hydrogenated Palm Kernel Oil, Aluminum Hydroxide, Hydrogenated Palm Oil, Tocopherol, Lecithin, Bht. [+/-: Ci 19140 (Yellow 5, Yellow 5 Lake), Ci 42090 (Blue 1 Lake), Ci 77007 (Ultramarines), Ci 77163 (Bismuth Oxychloride), Ci 77288 (Chromium Oxide Greens), Ci 77289 (Chromium Hydroxide Green), Ci 77491, Ci 77492, Ci 77499 (Iron Oxides), Ci 77510 (Ferric Ferrocyanide, Ferric Ammonium Ferrocyanide), Ci 77742 (Manganese Violet), Ci 77891 (Titanium Dioxide)]. Transform shapeless, undefined eyebrows with just a few flicks of this super-slim pencil. The custom, ultra-fine tip makes adding detailed definition to your brows easy, by drawing incredibly natural, hair-like strokes. This rich, waterproof pencil is ideal for spot filling sparse or over-tweezed areas. The smudge-proof formula is firm enough for precise application yet glides on effortlessly to bring symmetry to your brows—and your entire face. The custom control grip ensures you have precise application every time, and the built-in spoolie-brush expertly blends color & tames brow hairs for a natural, polished look. Now available in 12 shades! Hold the pencil along the custom control grip. To shape brows, use longer, horizontal strokes along the base of your brow. Fill by drawing short, upward strokes in the direction of your natural hair growth. Gently brush through brows with the spoolie to evenly blend color & tame hairs. When this arrived, I had forgotten about it. And I also forgot to check the pencil color, ending up with #2 Light. I was hesitant initially, thinking it would be too light (I have light brown hair with gold). I have been using a darker pencil, medium usually and thinking I was terrible at brows. Nope, I just always had too dark of a color! This went on easily, and if I felt I had overdone it then the spooly blending it out nicely. I am very happy with this product and how it looks and wears. Love it. This is O.G. product that can't be beat! Firstly let me start off with...If you're bleach or light blonde ..go with 02_taupe ...NOT the lightest shade. I am a natural blonde but I lighten it which means my brows are naturally clear so I been penciling in my brows well before it was even a thing on YouTube ok? Im a pro at this. And...This is the perfect shade for us light blondes! Its just the perfect pencil. Benefit got it right and Anastasia cany even compete. This pencil with everyday use I can get 3 months out of. It's waterproof, and clump free. 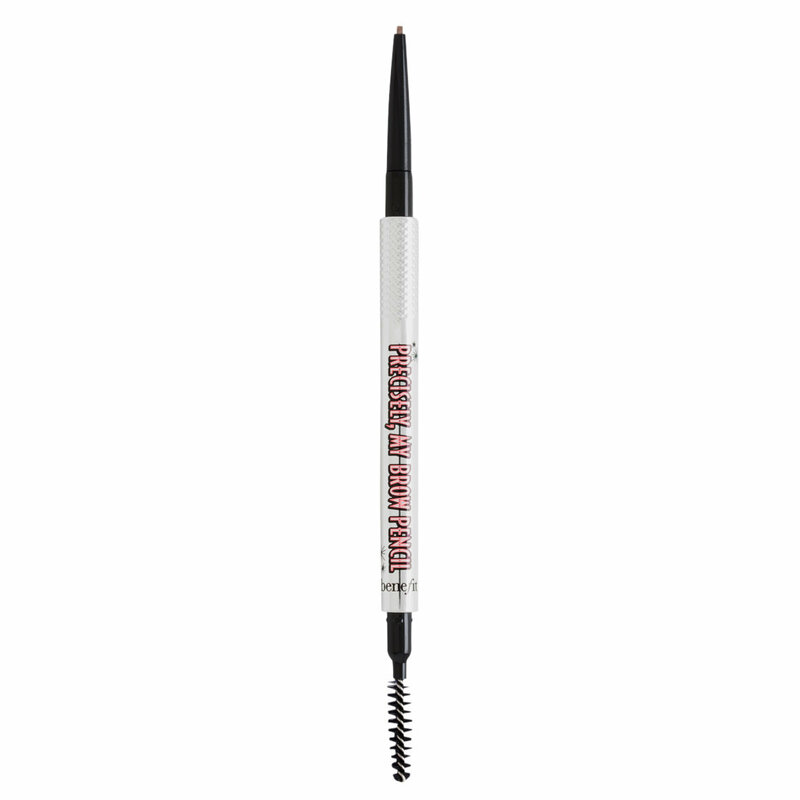 I love brows period and anytime I want to try a new technique this pencil never lets me down. I can make hair like strokes as well as big full brows. I can sweat, run, and even swim and I know my brows will still in place with this pencil. I use the 24 hour brow setter as my top coat to create texture in my brows. I have tried many other brand, but I always come back to this pencil. I also have found this pencil not to be creamy which for me is a plus to make my brows appear more natural when filled in. I love this brow pencil above all others because I can really achieve the microbladed brow look. The Precisely, My Brow Pencil is thin enough that I can create hair-like strokes for a more natural looking brow, or outline and fill in my brows for a fuller brow. Tip: Use the spoolie on the other end to blend out any harsh lines. It will soften the intensity of the strokes and make your brows look more natural. My must have brow pencil, not too waxy and really pigmented. This product last on my brow through my whole work day without moving or fading, lasts even longer when i apply the 24hr brow setter.